We are committed to offer our respectable customers a wide range of FRP Fiberglass Operating Rod. We are a unique entity in the industry, actively committed to providing a qualitative range of GFRP Rod. We are offering FRP Rod. Manufactured in automatic pultrusion plant. Strong & sturdy. Pushing & pulling Isolator Blade in live connection 630 KV Tested. Available in: 8' to 10' 12' 14' 16' 18' feet length. - Aligning blade of A.B. Switch. MEI is also a manufacturer and exporter of Fibreglass (FRP) Rods, tie rods of desired sizes and length required by our customers. These FRP tie rods are also been used in Electrical industries along with Nuts, for high Voltage appliances such as Dry type Reactors / Transformers, Lightning Arrestors etc. - FRP / GFRP Volley Ball Antenna (Pipe/Road). - FRP / GFRP Rod for Riding Crops. - FRP / GFRP Roman Rings. - FRP / GFRP Flag Stick. - FRP / GFRP Arrow Shaft for Archery. SYFLAT is manufactured using E-glass fiber with proprietary resin system. It is available in tuff coated surface, which allows easy handling. Tuff coating provides very smooth surface. It is currently available in 1 mm x 2mm and 1x 3mm dimensions, however, any other dimensions can easily be supplied on request. - Application: Polymer/Composite Insulators, MV/LV Switchgear, Tent Poles, Flag Posts & Various other applications. - FG Rods are available in both Epoxy & Polyester. - Sizes Available (mm): 8, 10, 12, 16, 18, 20, 22, 24, 25, 27, 32, 38. Di-electric cable composite strength member widely known as FRP/GRP rod is designed to provide excellent strength performance while maintaining high degree of stiffness, preventing cable buckling over its entire service life. We are counted as prominent name in this domain, involved in offering supreme quality range of FRP Rods to our clients. This product is used for different industrial and commercial working and widely appreciated for its rugged construction. As per the demand of our clients, we are providing this product in bulk. 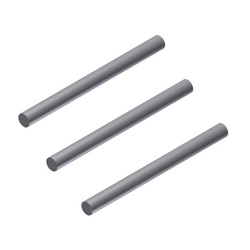 Our range of Solid Rods can also be customized as per the clients’ requirements. These are resistant to corrosion and made from steel to meet several industrial application requirements. Properties: Excellent insulation properties, moisture resistant, good mechanical & impact strength, high dielectric strength, light weight, dimensionally stable, ease of machining, excellent tensile, compressive and flexural strengths.